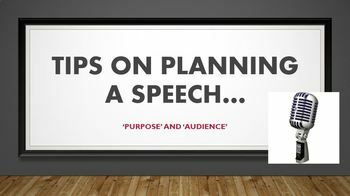 This PowerPoint presentation directs students through the initial planning stage when writing a speech, focusing on 'purpose' and 'audience'. It includes specific questions and examples that will assist any teacher with their teaching of speech planning. Teacher input is required, and will add depth to the learning and understanding of the students, but the content of the presentation provides a framework. Teachers may wish to model their own speech planning, using the structure and questions included in the PowerPoint. This PowerPoint presentation can be used with the whole class or in smaller groups. 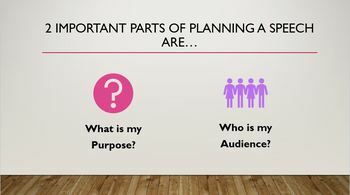 The content of this PowerPoint is also able to be used to teach other forms of writing, as 'purpose' and 'audience' is relevant to any written text.